Hello and welcome to the Flter connection guide. This guide will help you set up your new Flter privacy router and select the configuration that is most useful to you. An Access Point connects to a wired router, switch, or hub via an Ethernet cable and projects a WiFi signal to a designated area. This is the configuration utilized most frequently by Flter users. While everything is powered off, connect the included Ethernet cable to the WAN port on the back of Flter. Then connect the other end to your modem. After connecting to Flter’s WiFi type 192.168.8.1 in your web browser to access Flter’s web page. Alternatively, you can download Flter’s App for iOS or Android. Log into Flter using your vpn.flter.me account. If you did not receive VPN subscription information please email us at hello@flter.me. If you don&apos;t want to sign in with your VPN account you can create a local account by selecting the "log in with a local account" link at the bottom of the page. Please note that if you use a local account you will not be able to reset your login credentials and will have to factory reset the device. The VPN account login also offers Two-factor authentication to keep your home network safe. After logging in, you can select which Flter features you would like to utilize (e.g., VPN, ad blocking, Tor); and Flter will begin working automatically. A repeater extends the range of a wireless network by receiving signals from a wireless access point or router and broadcasting it to other wireless clients. 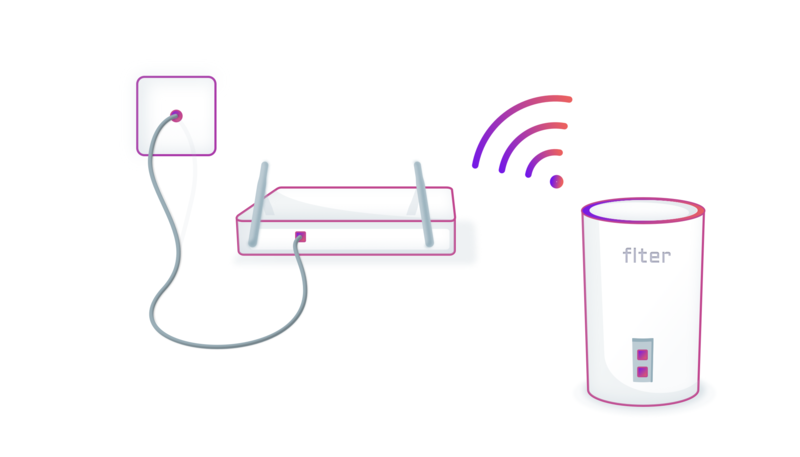 As a repeater, Flter can connect to and amplify the signal of your wireless network. All devices connected to Flter’s wireless network will be protected by all of our security features. Follow the same steps outlined above for setting up an Access Point. After step 1 has been completed, the Flter router can now be moved to your chosen location. Connect Flter to a power source at your selected location. This can be a power outlet or, if you’re traveling, a battery bank or computer. Connect to Flter via WiFi or wired connection by using the Ethernet port on the side of the device. Login to Flter and click on “WiFi” to access the WiFi settings. Turn the Repeater toggle switch on, and then select the network you would like to connect to (you will be prompted for a password on secure networks). Flter can create a bridge between your modem and your current router. This configuration will allow all network traffic to be protected by the Flter device, while still utilizing your main router. Disconnect the power of your modem and router. 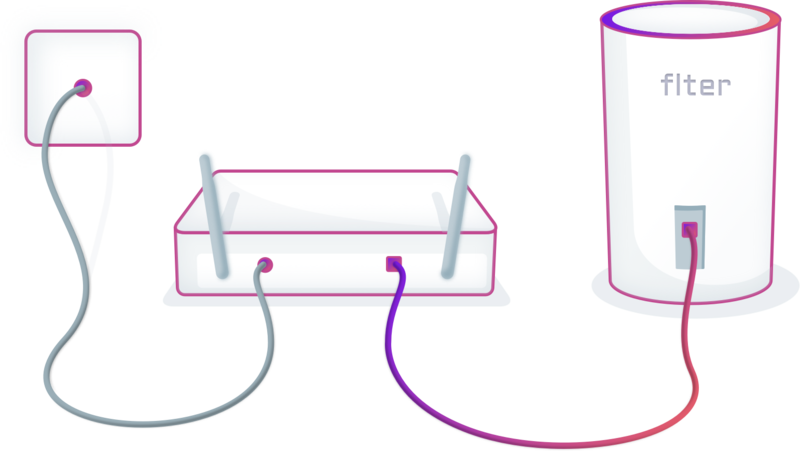 Link Flter between your modem and router by connecting one Ethernet cable from the router to the LAN port on Flter and a second Ethernet cable from the modem to the WAN port on Flter. Plug the modem, router and Flter, into a power outlet. Flter should automatically download and install the latest software or, alternatively, you can connect to Flter via WiFi or Ethernet and type 192.168.8.1 in your web browser to manually update. Once Flter updates, create your account by downloading Flter&apos;s App for iOS or Android or by going to 192.168.8.1 in a web browser. Once logged in you can select which Flter features you would like to utilize (e.g., VPN, ad blocking, Tor network anonymity); and Flter will begin working automatically. This option is not available for two-in-one modem/routers.